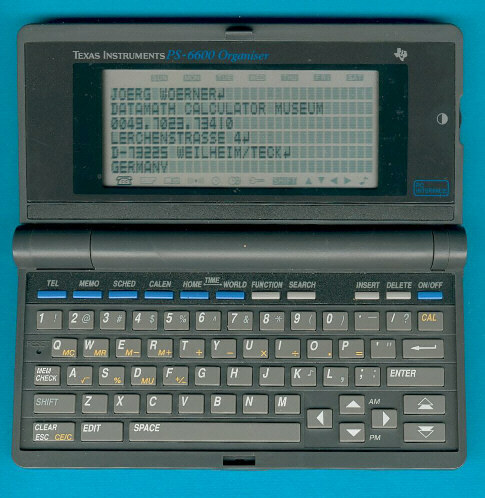 Size: 3.3" x 6.0" x 0.8"
The PS-6600 Organiser continued the approach started with the PS-6200 Organizer and leading to products like the PS-6700 before ending with the PocketMate 300 in the year 1999. In the United States an almost identical product was sold as Organizer. • A calendar from January 1901 to December 2099. The display of the PS-6200 is very useful supporting 6 lines by 32 characters. The direct successor of the PS-6600 could be found with the PS-6700 and the enhanced sibbling PS-6800. In 1994 the design of the PS-6600 was slightly changed. Don't miss the TI-81 graphing calculator using almost identical hardware!